"Katherine Anne Pryde was only thirteen when she learned of her mutant power to phase through solid matter. Soon she became one of the youngest and brightest students in Xavier's School for Gifted Youngsters, training with Wolverine to become a skilled combatant. As Ariel, Shadowcat, and Kitty Pryde, she fights for what's right and is always there to back up her fellow X-Men." 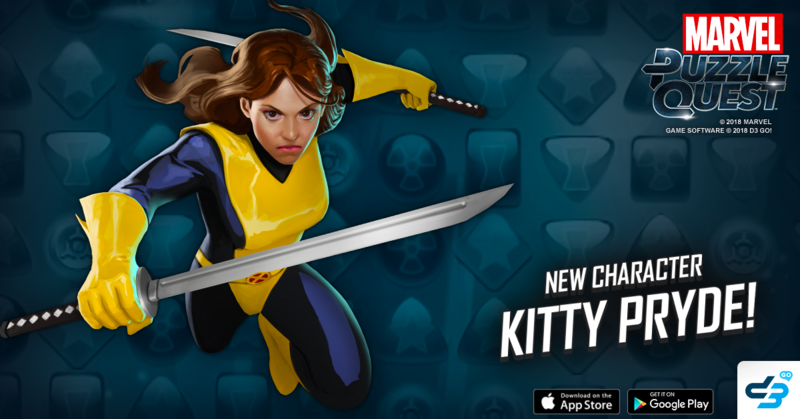 Check out the brand new 5-Star Kitty Pryde, and find out how you can recruit her onto your team! When the X-Men are in trouble, Kitty leaps into the fray and phases them to safety. Create 3 Yellow Protect tiles with a strength of 417. (PASSIVE) At the start of her turn, if there are 4 or more friendly Strike, Attack, or Protect tiles on the board, improve them by 633 (Max 5 tiles). For every member of the X-Men on Kitty's team, this threshold goes down by 1. Kitty phases through the enemy's defenses, catching them off-guard when their systems fail. At the start of the turn, if one does not exist and enemy Strike, Attack, or Protect tiles are on the board, create a 1-turn Fortified Purple Repeater tile that will replace enemy Strike, Attack, Protect, or Countdown tiles. If no enemy special tiles are on the board, this tile destroys itself and deals 13,286 damage. In one swift movement, Kitty Pryde phases through the enemy before they can strike and cuts through their back line defense. Creates a 9-turn Red Countdown tile. While this tile is on the board, if Kitty or one of her teammates takes damage from an enemy power, create 3 strength 469 Attack tiles. Stay tuned! Her full Character Details are coming soon.